Pickerel-weed grows right out of shallow water at the edges of our ponds and streams and blooms all summer. From mid-summer to late summer, when nature dabs the landscape with purple, especially in damp places areas, you might spot spikes of purple blossoms sticking out of the shallows in Westborough’s ponds and streams. The plants grow right in the water, often in colonies. What is this plant? It’s called pickerel-weed, perhaps for the pickerel fish that may find shelter among the plants. But there’s apparently no special association – such one involving feeding or breeding – between the fish and the plant. Native Americans used the name wampi for the plant. Our native pickerel-weed (Pontederia cordata) blooms from June to October, and it’s particularly obvious at this time of the summer. The plant has large, glossy, arrowhead-shaped leaves and a thick stem rising 1-3 feet high out of the water, with its spike of purple flowers on top. Its leaf stalks are partly hollow, with air spaces that help the stalks stay upright in the water. Can you eat it? This might seem like a strange question, but even if you’re not in the habit of munching the local wild landscape, the answer can be interesting. It can give you a glimpse into the past, when people were closer to nature, and hint of possibilities for living off the landscape, even today, either by choice or in an emergency (think of hikers lost in the woods). Many native plants were food sources for Native Americans or early colonists, and pickerel-weed is no exception. People picked the leaves while they were young and unfurling and boiled them as greens. When the flowers are spent, the plant forms oddly shaped, starchy green fruits, with one seed each, and the flower heads are full of them in September. People collected the fruits when the stems leaned over and tipped their heavy tops into the water. The fruits could be eaten raw, in spite of their odd appearance, or dried, or boiled or roasted and ground into flour. Colonists sometimes added this flour to their wheat or rye flour. Pickerel-weed also provides food for wildlife. Ducks such as mallards, American black ducks, and wood ducks eat the seeds. Muskrats consume the leaves and seeds, and sometimes use the stems in building their lodges (although cattails are their favorite food and building material). Deer also eat the leaves. Pickerel-weed’s flowers bloom from the bottom of a spike upward. Each blossom lasts about a day. They are rich with nectar that attracts bumblebees and other bees, butterflies, and occasional hummingbirds, so pickerel-weed can be fun to watch. Dragonflies and damselflies also rest on the plant, and some lay eggs in its stems. Several moth caterpillars bore into the leaf stems to feed, including one named the pickerel-weed moth borer (Bellura densa ), which turns into a hairy brown moth. You’ll probably find pickerel-weed in large patches. There many if not all of the plants have grown from underground runners, rather than from seed, so they’re genetically identical. This way of spreading is a great way for a plant to grow quickly in favorable conditions, but it could lead to inbreeding, which is not healthy in the long run. Fortunately, pickerel-weed has a way of encouraging cross-breeding and genetic diversity. The trick is in the way the flowers are set up. It turns out that in pickerel-weed, the pollen-receiving flower part, or style, comes in three lengths – short, medium, and long – in the flowers of different plants. The pollen-producing flower parts, or stamens, of a flower are of different lengths than its style. For example, a flower with a short style will have stamens that are medium-length and long, for example. This arrangement means that any flower is best pollinated by pollen from a different flower that has stamens of a matching length, such as short stamens to match a short style. So how does this complicated-sounding scheme work? The pattern of pollen on bees’ bodies is the key. When bees visit the flowers, stamens of different lengths dust different parts of their bodies with pollen. The front of a bee, for example, would be dusted mostly with pollen from short stamens, so when that bee pushes into a flower with a short style, some of that pollen brushes off on the short style. Things happen similarly for medium styles and pollen on the middle of a bee, and long styles and pollen on the back of a bee. In this way, pickerel-weed flowers tend to get pollinated with pollen from genetically different plants (probably from a different patch) that have a different but matching set of flower parts. The resulting genetic diversity in seeds prepares future generations of plants to adapt to different or changing conditions. Pickerel-weed is not only lovely and interesting, but it’s also an example of a wetland plant that’s good for the clarity of the waters it inhabits. It helps to remove overabundant phosphorus and nitrogen – fertilizer ingredients – that arrive in run-off and tend to over-enrich the water. 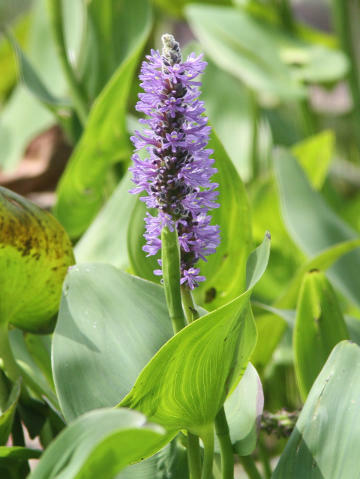 So look for pickerel-weed along the shorelines when you enjoy the beach and our ponds and streams. And take a few moments to delight in the many hues of purple in other plants of late summer, from the blue-purple of blue vervain to the rose-purples of swamp milkweed, the lovely but unlovable invasive purple loosestrife, native Joe-Pye weed, tick trefoils, gerardias, steeplebush, and eventually the purple asters of fall. For anyone who’s seriously interested in finding out about the uses and edibility of wild plants, an authoritative and readable reference is Ancestral Plants: A Guide to Important Edible, Medicinal, and Useful Plants of the Northeast, by Arthur Haines (Anaskimin, 2010).